Fortuitous hasn’t been in the water in several weeks, and frankly I’m starting to get the shakes a bit, but Jen and I have been keeping up with nautical things to the best of our ability. We resumed our annual combined University of Delaware football/Annapolis Boat Show/wedding anniversary weekend—a tradition that predates our boat ownership. The first stop was Delaware. I was slow on the draw and was unable to secure a room across the street from the stadium this year. This meant that we’d have to actually tailgate. Being inherently antisocial, I’d gotten spoiled by being able to drink in-season Oktoberfests from proper barware while watching cartoons from the comfort of our hotel room in preparation for the game, as opposed to sitting on folding chairs in the weather with drunk children throwing footballs over our heads. The most underrated part of being perpetually negative, however, is that it’s easy to be pleasantly surprised, and tailgating turned out to be great. It was cool out, with a steady breeze in the 10-15kt range. Rain threatened early but never quite materialized. Jen avoided getting hit in the head with a football [this time], and we had excellent hoagies from Capriotti’s that paired perfectly with 16oz cans of PBR. The game had the appropriate amount of spectacle, although the outcome was disappointing. 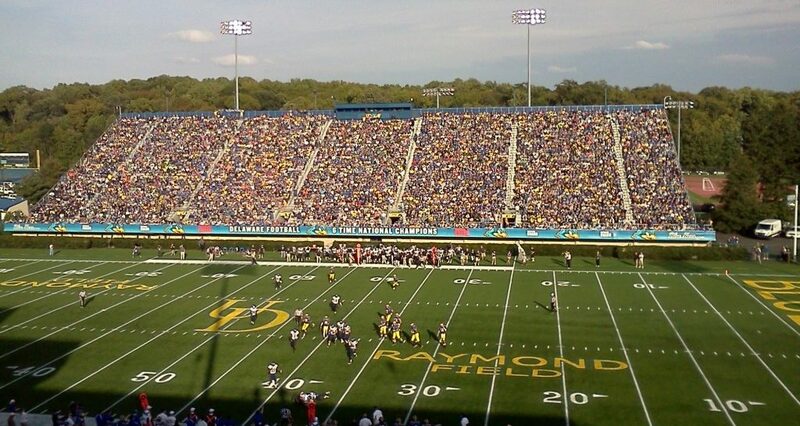 Delaware had been favored by a lot over Maine and we were expecting a gaudy victory, but it turned out to be like a fight between literal black bears and chickens and the Blue Hens got their cloacae handed to them. We did get to see the 2000 piece marching band (approximate) play all of our favorite songs from the 1985 western Silverado, and you haven’t really heard Lady Gaga until you’ve heard it interpreted for the sousaphone. Sunday, we were off to Annapolis for the 43rd annual US Sailboat Show. We didn’t really have any plans for purchases or specific research, but it’s nice to see what’s going on in boating trends. Not surprisingly, I suppose, the boat show (and the entire sailboat industry) seems to be geared toward the ridiculously wealthy, and it may be skewing further in that direction. Sailboats have long lives and terrible resale value, so for working shmoes the idea of a new sailboat is pretty absurd. Used boats are plentiful, and with the economy in the toilet, very reasonably priced. This is just based on armchair observations, but it seems like manufacturers are just conceding the mid-sized boat market (I’m talking about 30 footers, plus or minus a few feet) and focusing on the big stuff. For example, Sabre Yachts, one of my favorite builders, has made boats over the years in 28′, 30′, and 34′ versions, among others. Today, the smallest new Sabre cruiser that you can buy is 42′, for a price of approximately infinite money. 42′ is huge, bordering on being too big for a couple to comfortably sail by themselves, and the slip fees and upkeep are proportionately large. They do make a 36 footer called the Sabre Spirit, but it’s a 36′ day sailer. It’s an absolutely beautiful boat, but it features an enormous cockpit and relatively little room below to make long distance cruising comfortable. To make matters worse, I haven’t yet rectified what I want and what I need in a theoretical next boat. I’m fascinated by the trend in modern boats to carry a small, fractional blade jib that can be sheeted way in and a furling asymmetrical spinnaker for downwind. A small jib is easy to tack and fast when working upwind, and a furling A-sail or gennaker is an efficient way to get a lot of sail area up off the wind. This type of arrangement is cool, but is featured mostly on boats that lean toward racing, which isn’t really our thing. These sorts of boats also typically have high aspect keels that are way too deep for where we sail, which makes them pretty much useless for us. J/95: No, it’s not 95′ long, it’s 9.5m, or about 31′. The main thing about this boat that I find attractive is that it’s a keel-centerboard. It has a short weighted keel trunk that provides the ballast, with a relatively light centerboard that can be lowered from it to provide extra hydrodynamic lift. This boat will sail (fast) in 3′ of water, which is rare in a modern design. As much as I loved the idea, this boat leans heavily toward the pure racer end of the spectrum. The interior is functional, but sterile, and lacks a galley, refrigeration, and the touches that would make it a comfortable cruiser. I have no doubt that it’s a blast to sail, but it’s not for us. C&C 101: I knew very little about this boat going in except that it’s a 33 footer from C&C, a venerable maker of quality cruiser/racers. They were sold to the “new” Tartan not too long ago, and I’m not sure what impact that’s had, but this boat was certainly too racy for us. It boasts lots of high tech materials, including things like NPG Isothalic gelcoat, BPA Epoxy hull laminate, and both unidirectional and bidirectional E-glass, none of which I fully understand. This boat may be even more race oriented than the J, and with a draft of 6’6″, too deep for our waters even if we otherwise loved it. Catalina 315: Fortuitous is a Catalina, and I’m sure that their hope is that we’ll stay “in the family” when/if we ever upgrade. The 315 is tempting in that regard. Catalina has resisted the trend toward plumb bows and sterns, and they’ve managed to keep their new designs fresh while still looking like Catalinas. This boat is definitely a cruiser, from the complete galley, aft cabin, and nod to a chart table to features like the (optional, I hope?) furling main and cockpit canvas. Everyone I know swears by their bimini and dodger, and maybe I’ll eventually come around, but to me they’re unattractive, add windage, and obscure the sails, making it difficult to optimize trim. I imagine that when you have a boat that can handle the long cruise and actually use it as intended, you come to appreciate the shelter, but it will take some time for me to get used to not looking at the sails to see how they’re flying. Presto 30: This guy is a bit of a weirdo, but an interesting departure from the norm. It’s a cat-ketch rig, with double unstayed carbon masts and wishbone booms…kind of like a modern take on the sharpie with some windsurfer technology thrown in. It’s internally ballasted with a fully retractable centerboard, making it very good for thin water (although possibly not heavy weather, despite claims to the contrary in their literature). It’s not really a long haul boat and certainly not a racer in my opinion, but would likely be a great boat for doing something like exploring the less-traveled tributaries of the Chesapeake. We didn’t get to spend too much time on this one because there was someone passed out in the cabin and the handler really didn’t want to talk to me, but I’ve been reading about these for a while and was glad to see one in person. We saw a bunch of other boats too, but these were the highlights of the 30ish foot range for me. Most of the docks were taken up by much larger boats, and there seemed to be a plague of multihulls this year, which I find completely uninteresting. We spent more time wandering around the vendor tents than actually looking at boats, which we both enjoy, and at least they sell things for under $100,000. As I go through the mental exercise of organizing these thoughts, it’s probably easy to wonder why we even bother going to the show, since we won’t be able to afford a mid-sized boat from the 2013 model year until approximately 2043 and there are few mid-sized boats being made that we even like, but the reality is that it’s fun to go regardless. Even if it’s just to needle the anchor peddlers, creatively fend off the aggressive sailing mag merchants, or fondle the deck cannons, it’s cool to be immersed in sailing junk. Following the state of the art is interesting, whether or not the advances will wind up trickling down to the likes of us. I hope to look back on all of this and laugh when we’ve had a chance to winnow down what we really want in a boat over the next couple years.